The inspection report makes 29 recommendations over the broad categories of governance, administration, municipal operations, and finances. The Minister accepted the inspectors’ conclusion that the county is managed in an improper, irregular, or improvident manner and requested council to provide written comments on the report, including council’s plans to address the issues identified in the inspection report and strategies to implement any of the recommendations. o   Council has 45 days from the date the report (August 28, 2017) was presented to the public to submit the plan (October 12, 2017). The Minister may issue directives if council’s plan does not adequately address matters identified in the inspection report. Ministry staff will continue to be available to council and the chief administrative officer to provide advisory support and assistance as they require. Coun. Steve Schafer was unavailable for comment on this piece. Some capital planning efforts were observed. A 2008 Master Services Plan was completed by Associated Engineering, however, the town did not appear to fully use this plan as a guiding document. 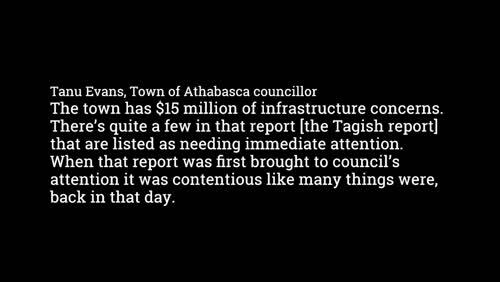 In 2016, Tagish Engineering Ltd. completed a Town of Athabasca 2016 Infrastructure Study which focused on existing infrastructure and short-term growth. The 2016 Infrastructure Study provides recommendations in many service areas. The study also proposes a 10-year capital plan requiring annual expenditures of approximately $1,500,000 to address existing infrastructure problems and to prepare for new growth. 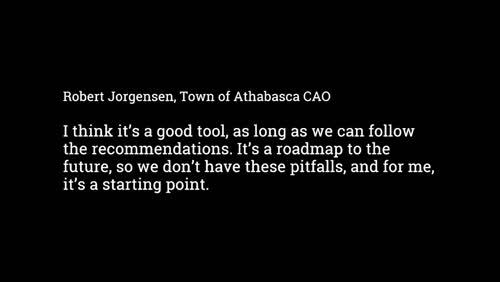 RECOMMENDATION FOR CAPITAL PLANNING: That council, in consultation with staff and the town engineers approve a comprehensive five and ten-year capital works plan to address existing infrastructure issues and new or upgraded infrastructure required for community growth. if I burn political capital while I do it...I’ve piled up enough of that to say burn, baby burn. 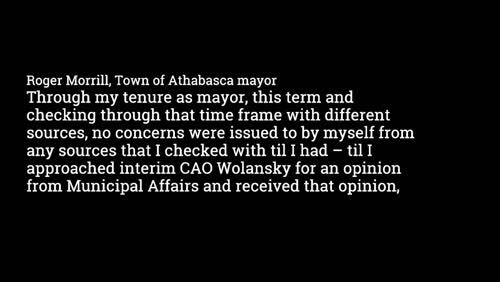 Over the past four meetings, the Town of Athabasca’s council has voted to disqualify the mayor and a councillor and remove them from all committees. They have voted against calling a lawyer about a staff intimidation statement – but voted in favour of publishing a letter about their own efficiency. What’s on the agenda for tonight? 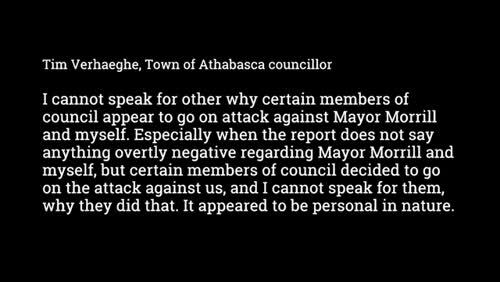 Overall, the extensive council drama caused a loss of public patience and confidence in the council members that were elected and entrusted with community leadership. 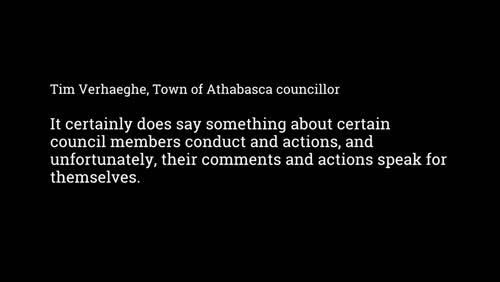 The inspectors heard concerns from several stakeholders over allegations that Mayor Morrill and Councillor Verhaeghe did not reside in the community yet still served on town council. 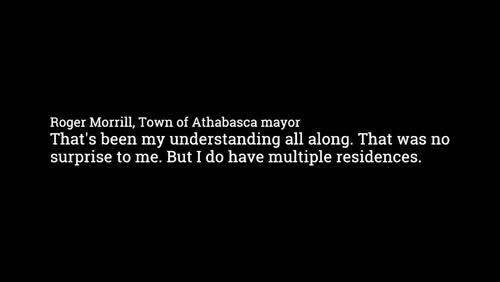 Both Mayor Morrill and Councillor Verhaeghe provided proof of residency to the inspectors in April 2017 with each showing a valid Alberta driver’s licence displaying an address within the Town of Athabasca. 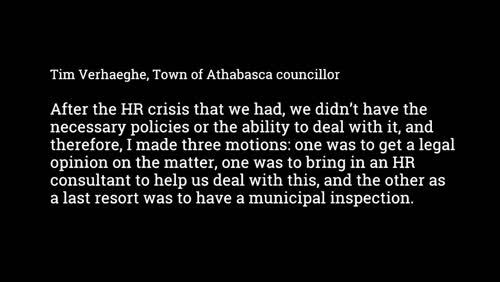 Town of Athabasca policies need attention and a dedicated effort to promptly address irregular matters and provide municipal administration with proper standards and guidelines for service levels. 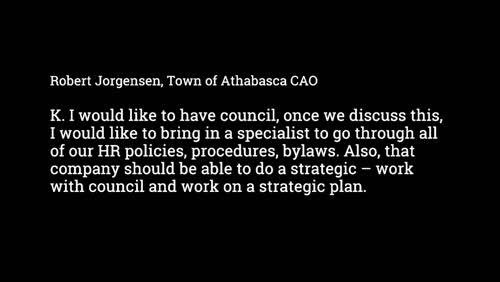 RECOMMENDATION FOR POLICY REVIEW: That the council authorize a policy review to correct irregular matters and ensure that approved town policies are consistent with the MGA, applicable trade agreements and other legislation. early 2016. 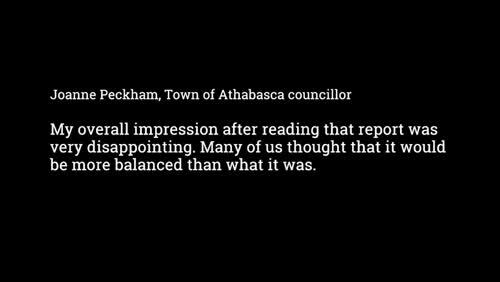 The administration committee for the town is counterproductive, poorly designed and should be discontinued. Council used a committee of the whole in previous years which met occasionally, included the “whole” council, and recorded activities with committee meeting minutes. 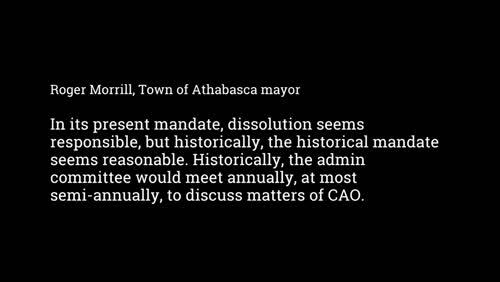 Some municipalities use a committee of the whole to accommodate expanded deliberation on issues, such as budgets. 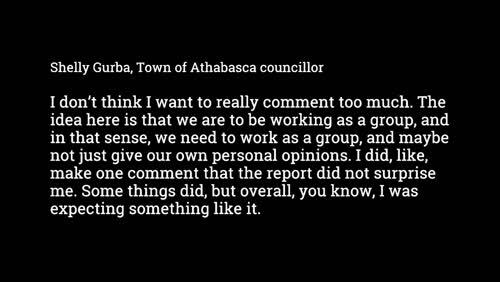 Some officials feel that a committee of the whole is a redundant use of council time and that if the “whole” council is present, they might as well have a council meeting. 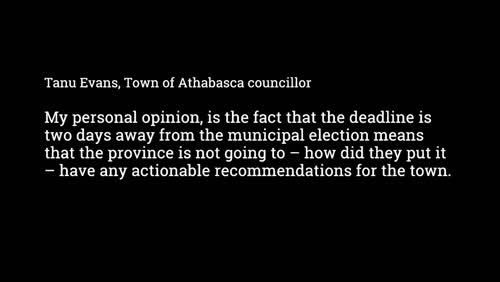 The pecuniary interest provisions in the MGA refer to the monetary effect of a council decision, which could be either positive or negative. It is appropriate for council members to seek legal counsel prior to voting or abstaining from voting on matters if they are unclear on a potential pecuniary interest matter. Legal counsel can consider the situation and advise a council member whether or not they have a pecuniary interest, or if they are required to vote on an agenda item. 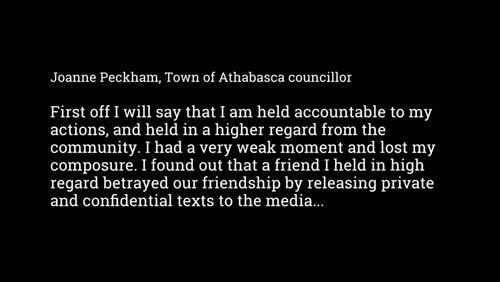 It appeared that some council members did not have a solid understanding of the pecuniary interest provisions of the MGA. 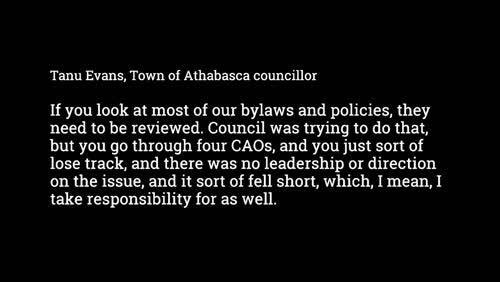 organizational stress, a damaged office culture, staff resignations, and tax dollars spent in pursuit of council disqualifications, which were eventually dropped. RECOMMENDATION FOR HUMAN RESOURCES REVIEW: That the municipality undertake a human resources review to ensure the physical and emotional safety of all staff in their working environment. The Administration Committee was made up of council members, and this staff appeal policy enables staff to make their concerns political. 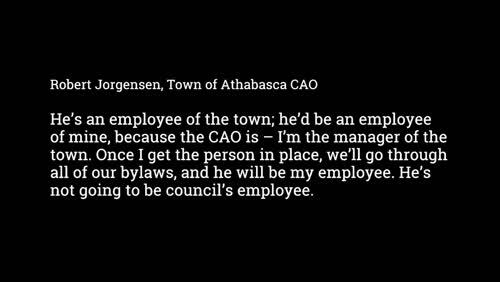 This policy circumvents the CAO, as the administrative head of the organization, and interrupts proper organizational order as it allows staff to appeal to their boss’s bosses. The policy places contentious and sensitive HR matters at the feet of council members. This is an improper practice which contravenes the MGA s. 201 and policy 300-014 should be rescinded. If there is a local desire to implement a staff appeal process, the new policy should refer to engaged dispute resolution resources and qualified, objective professionals to hear appeals. 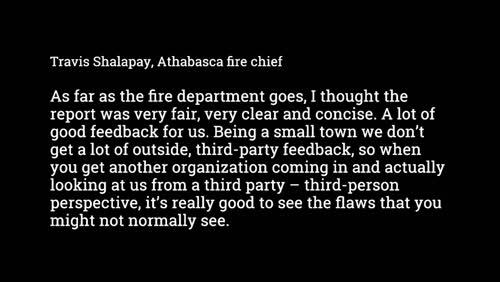 Contrary to position appointments outlined in the town bylaw, an internal system of officer elections was in place within the town of Athabasca fire department. 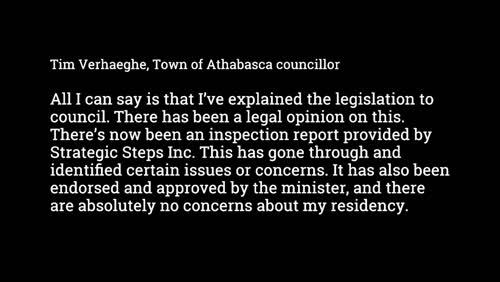 Athabasca does not have a Quality Management Plan in place for fire services under the Safety Codes Act and therefore the provincial office of the Fire Commissioner would undertake fire inspections and enforce Safety Code provisions. The volunteer nature of the department also presents resource capacity limits and it appears that this section of the bylaw may be better suited for a municipality with some full-time department officers. 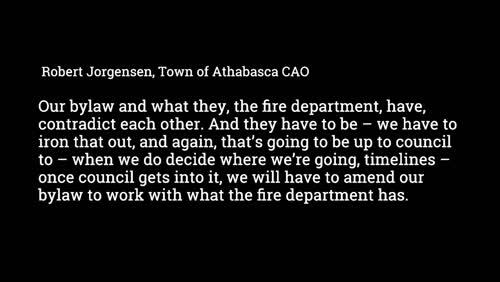 RECOMMENDATION FOR FIRE SERVICES REVIEW: That the council authorize a review of the fire services bylaw and fire department operational policies to ensure alignment and appropriateness. 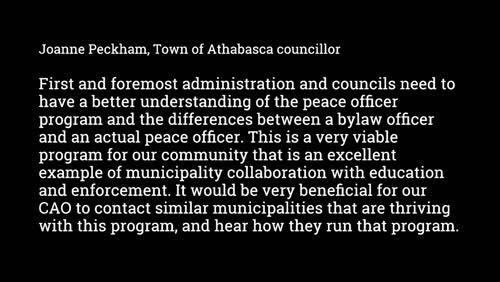 Athabasca’s Peace Officer Program struggled from a lack of clearly defined and consistent priorities. Some confusion appeared to stem from multiple CAO changes over the past two years where each CAO brought a slightly different vision for the peace officer program. A lack of consistent direction and management oversight appeared to contribute to a fairly self-directed peace officer program. RECOMMENDATION FOR PEACE OFFICER SERVICES: That council establish peace officer program priorities and service levels; and that the CAO provide guidance and oversight to ensure that a robust peace officer program exists in the community. Despite delegating local facility responsibilities to a formal society, some funding shortfalls and emergency expenses are still covered, or requested to be funded by the town. 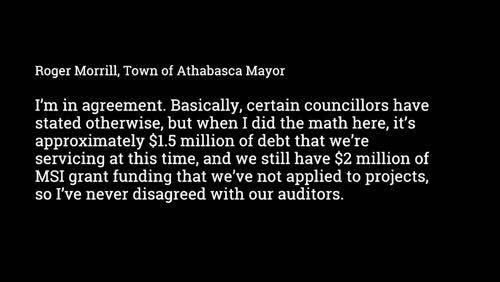 For example, on May 17, 2016 town council approved funding for arena netting and a hot water tank purchase for the multiplex society. Some stakeholders expressed concerns over the lack of reserve funding within the society’s financial picture. 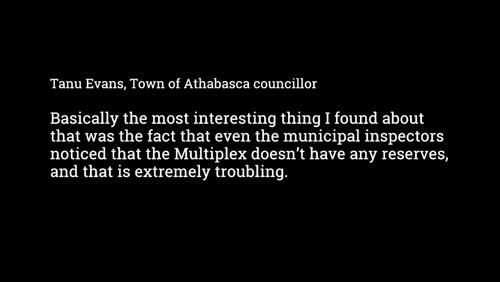 The current funding arrangement may not be sustainable and should be reviewed to ensure long-term viability and equity among all contributing partners of the Athabasca Regional Multiplex Society. 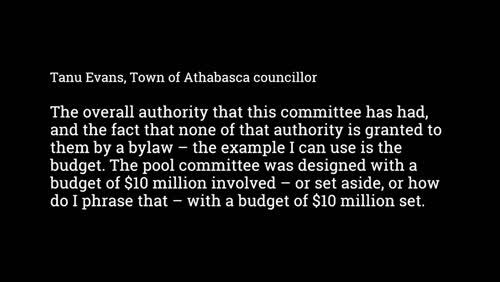 An irregular matter was identified where some committees were in place without an authorizing bylaw to establish their function, such as the pool design committee, FCSS board, communications committee, and administration committee. Various council appointments may contain some historical remnants of past practices. It is necessary to conduct a ‘refresh’ and review all council appointments to ensure appropriateness due to the passage of time and application of best practices. Most recently, the society has managed the process of design and construction for a proposed new regional pool which was still in the preliminary stages during the time of this report. 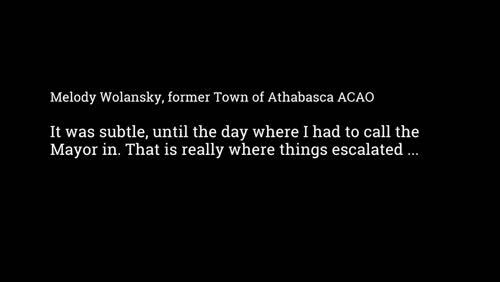 Through the society, the Town of Athabasca and Athabasca County entered into a cost-sharing agreement for the construction of a new aquatic center at the site of the existing Multiplex and new High School. Each municipality committed $5,000,000 to the project, totalling $10,000,000. Group2 Architecture Interior Design was retained and are currently finalizing the design of the pool, under the direction of a pool design committee. A concept plan was available on the town and county websites, as shown below. The final cost of the pool was estimated between $10 to $15 million, and officials were considering options such as grant funding and sponsorship in an effort to fund the gap.